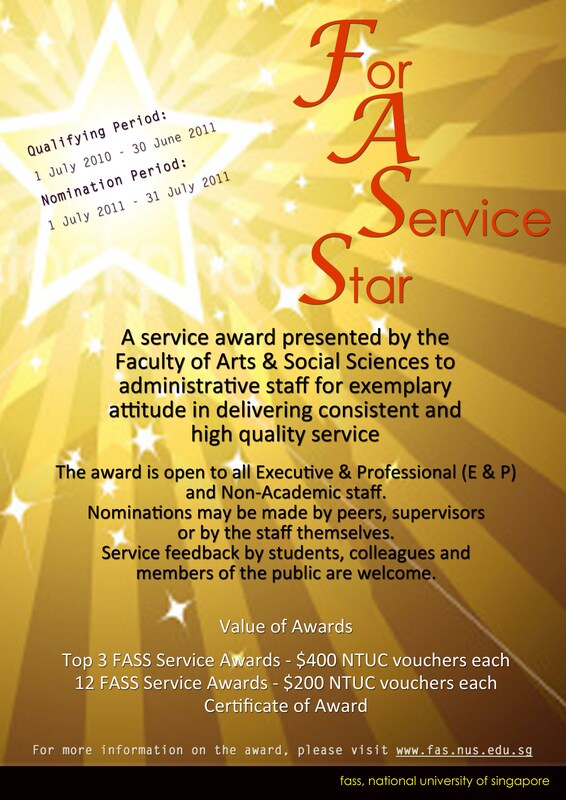 We all stand to benefit from all-round service excellence in FASS, whether as providers or recipients of good service. Send your feedback via email through fassaward@nus.edu.sg. their supervisors or to fassaward@nus.edu.sg. We hope you will make the effort to give due recognition to deserving administrative staff in the year ahead! 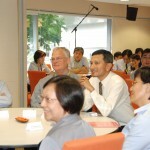 The SPH Foundation Lecture series was inaugurated about 2 years ago to promote lifelong learning. Anchored on the theme “Media in Transition: Social & Economic Impact”, this lecture series will feature American Professor Vin Crosbie this year. He teaches, writes and speaks extensively on new media (please see his profile below). Wednesday, July 14 at the National Library’s Drama Centre. There are 50 places. Vin Crosbie’s expertise is primarily how New Media affects the news and information industries worldwide. Earlier this year, when the Paris-based World Association of Newspapers/Ifra asked “ten of the world’s top newspaper consultants” to “weigh in on the soundest strategies for the future,” its resulting report, Charting the Course for Newspapers, led with Crosbie’s strategy. Likewise, last year when the Congressional Research Service briefed members of the United States Congress prior to hearings about the crisis in the U.S. newspaper industry, the first person (as well as the only academic) it quoted was Crosbie. Folio, the trade journal of the American magazine industry, has termed Crosbie “the Practical Futurist.” Editor & Publishermagazine, the trade journal of the U.S. newspaper industry, devoted the Overviewchapter of executive research report Digital Delivery of News: A How-to Guide for Publishers to his work. And Crosbie’s address to the Broadcast Education Association session of National Association of Broadcasters annual conference was one of 24 orations (including oratory by Barak Obama, George W. Bush, Condolezza Rice, and Hilary Clinton) selected by a team of speech professors for publication in the reference book Representative American Speeches 2004-2005. Each semester, Professor Crosbie teaches the Newhouse School’s media management course New Media Business. He also formulates executive education in New Media courses for the school and advise the school about keeping its curriculum up-to-date regarding New Media and technological changes. During the break between Syracuse’s Spring and Fall semesters this year, he also taught part of the Knight Digital Media Center’s News Entrepreneur Boot Campat the University of Southern California’s Marshall School of Business and taught a post-graduate and executive courses in Digital Media Managementand the Essentials of Managing Newspaper Convergenceat Rhodes University in South Africa. Since 1996, Crosbie has been managing partner of Digital Deliverance LLC, a Greenwich, Connecticut, firm that provides media companies with strategies on how to adapt to New Media. Prior to that, he was an executive with News Corporation, Reuters, and United Press International, and a newspaper editor and reporter. He is the fifth generation of his family in the news business. Crosbie has been the new-media columnist for the International Newspaper Marketing Association’s Ideasmagazine; contributing editor for the American Press Institute’s NewsFuturenewsletter; fortnightly columnist about online publishing for the ClickZ marketing website; and a founding contributor to the Poynter Institute’s E-Media Tidbitsgroup weblog. He regularly speaks at media conferences worldwide about what the news industry needs to do in order to survive and profit during the 21st Century. Crosbie was a co-chairman of the publishing program at the Comdex conferences in Las Vegas during the 1990s; keynoted the Seybold Publishing Strategies conference in 2000 and was co-chairman and co-moderator of Ifra’s Beyond the Printed Worddigital publishing conference during 2006 in Vienna. An experienced mountaineer with ascents in the Alps, North America, and Latin America, Crosbie has held a commercial guide certification from the U.S. National Forest Service and taught above-treeline travel and Nordic skiing for the Appalachian Mountain Club’s headquarters chapter in Boston. He lives in Syracuse, New York. MinaSunico.com is looking for a enthusiastic, creative, independent and efficient individual to be its newest editorial intern. The company specialises mostly in fashion, beauty and lifestyle. Inspire Publishing (www.inspire-publising.com) is accepting applications from students and graduates for its editorial internship program. Our editorial interns will be fully involved with the editorial team and will spend most of their time researching story leads and facts on the Internet, writing, fact-checking, copyediting, reviewing editorial submissions and correspondence, and assisting with shoots and logistics, among others. Interns have the opportunity to acquire short published clips and gain exposure to many aspects of magazine publishing. Innovations in the service sector that are related to sustainability and sustainability strategies in policy-making, business and society. The selection will be based on the applicants’ achievements in the field of sustainable development and their specific interest in cooperating with German partners. The winners of the competition will participate in a 10-day international science forum starting on 20 September 2010. Please submit your application documents to greentalents@dlr.de by 20 June 2010. For the programme brochure, please download from here. As Asiaone is launching their new education website, it is launching a contest known as Protect FYP, which targets students doing their final-year projects. Attractive prixes worth $5,000 worth are up for grabs. Details and e-flyer can be found here for your usage: http://www.edvantage.com.sg/. Contacts for this competition at Asiaone are: Ms Candice (6319 1871) or call/email to Ms Chui Hui Min at chuimin@sph.com.sg or 6319 5121. Support NUS student bursaries by taking part in RunNUS 2010, a student-organised race around the Kent Ridge Campus on Sunday, 15 August. Run in the 5km or 10km categories or sponsor a runner. A prize is available for the partici­pant who raises the most amount of money. For further informa­tion and to register, visit www.runnus2010.com. How will you shape your future? This was the overarching theme of the FASS Open House talks, its focus to introduce fresh A level and poly graduates the importance and relevance of an FASS education and invite them on an exciting and rewarding journey at FASS. 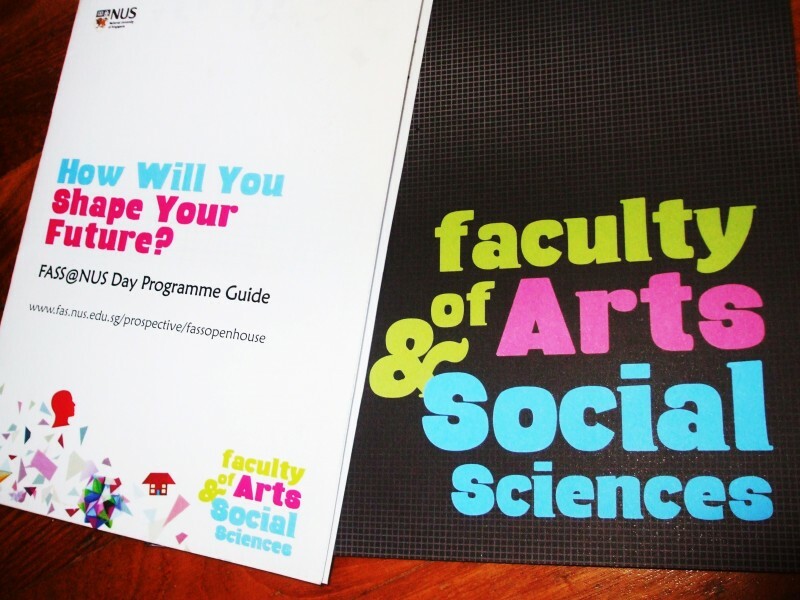 Before an eager audience of prospective university students, FASS Dean Professor Brenda Yeoh shared a broad overview of what FASS has to offer, which runs the gamut from a wide spectrum of courses to overseas programmes and award-winning teaching staff. During the talk, Professor Yeoh introduced each FASS department and outlined its scope of study, highlighting the possible job prospects for students majoring in that subject. This year’s FASS Open House featured theme-based talks conducted by each department, a refreshing departure from the usual approach of a direct introduction for each discipline. Designed to be engaging and effective, the talks bore catchy titles like ‘Stork and Cupid out to Lunch’ (Sociology) and ‘Showdown! The Little Nyonya v. Emily of Emerald Hill’ (Theatre Studies). The use of themes was to enable each department to present not just its field of study but its application in the real world too. In ‘Stork and Cupid out to Lunch’, Professor Paulin Straughan discussed the kinds of research and methodologies engaged in Sociology, drawing from her pet researches examples of pressing social issues like low fertility rates and presenting its implications on Singaporean society. Livening up the programme of talks was a lineup of special performances that displayed the vibrancy and diversity of FASS. The audience was treated to Thai music performances, serenaded by a student vocal group and invited to participate in quizzes on history and South Asia. FASS undergraduates gave out course brochures and enthusiastically shared their learning experience first-hand with inquisitive students. Over free popcorn and cupcakes, prospective students visited the various course booths, made enquiries about course details and conversed about university life. Based on the feedback gathered, most students were drawn to FASS for its wide academic offerings. Student Sabrina Tong, who intends to major in Communications and New Media, shared: “FASS is a very diverse faculty which offers many opportunities to students to expose themselves to different perspectives from different fields of thought.” The broad range of languages offered counts as another attractive factor, especially for student Adrian Ng, who considers learning a foreign language a useful advantage. When asked about his overall impression of FASS, he chirped: “FASS has a lively environment and people there are friendly!” Having visited the various booths at the Open House and chatted with FASS undergrads about the various courses, Yogez Wari waxed lyrical about how everyone at the Sociology booth were warm and approachable, rendering her a better insight of her intended major. She left the event enlightened and thrilled about embarking on the FASS track. “FASS is going to be a very enriching place to be in. I can’t wait!” she enthused. It sure is, Yogez, an exciting and FASSinating journey awaits! 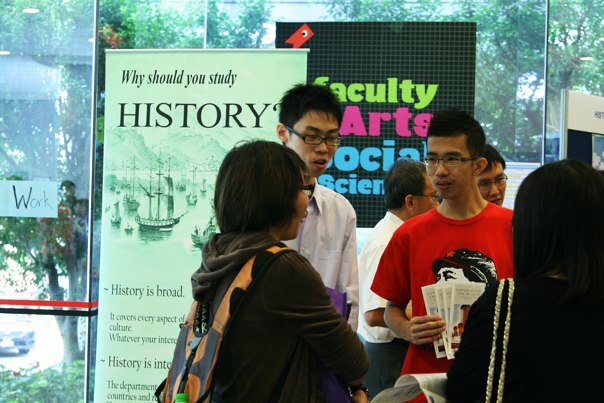 Personal interactions between visitors and representatives of FASS (the student volunteers and Department staff alike) at the booth remain the highlight of FASS @ NUS Day 2010. Visitors whom I approached appreciated this aspect of the event, especially when they were able to obtain personalised accounts of student life from the friendly and approachable volunteers. Incoming student Hannah Lee noted that there was “a lot of interaction” at the event and she commended the student volunteers, tutors and professors alike for a job well done. While posing as a prospective student, I visited the different booths at the event, asking questions that I thought that a typical student visitor might have asked. Instead of simply taking their word for it, I was able to experience this “interactivity” that many visitors spoke of. People were upfront and friendly, even as the usual scenario at such fairs meant that flyers are thrust left and right to the incoming visitor, especially when the crowds begin to form. A survey with the some booths had showed that the average student visitor tended to ask pragmatic questions about “career prospects”, the “differences between the disciplines”, as Christopher Navarajan, a Sociology Teaching Assistant had observed. This was generally the case for the social science Departments. Penelope Wang, a first year Psychology Major, concurred that visitors had mostly practical concerns in their inquiries, as she had often been asked to elaborate on the module assessment and the jobs that Psychology Majors could take on upon graduation. Even then, there were a few exceptions, as some Departments attracted students who are already passionate about the subject. The History Department conducted a quiz on Singaporean History at 3.35pm and there were easily about 10 enthusiastic participants. Farhan, one of the Philosophy Majors who was manning the Philosophy booth, noted that the students that he had talked to were “already ‘converted’”, in the sense that they were already keen on the subject even before attending the event. Rather than posing inquiries about the course requirements, these student visitors were more interested in finding out about the student life and the learning environment in the Philosophy department. The same applied to the Southeast Asian Studies department, as student volunteer, Bryan Yue had noted. He said that visitors to the booth are generally “really interested” in the major and they would “come straight to the booth” even without much prompting from the student volunteers. The different Department booths, on their end, employed a range of methods at drawing visitors to their booths. Besides information booklets, volunteers handed out additional giveaways. Some Departments organised quizzes and cultural performances as well. Moving away from the crowds, I walked towards the other end of the ground floor, towards the English Language and Literature booths. Nicholas Liu and Koh Xin Tian, both Year 4 English Literature Majors approached me almost immediately, with information booklets on the English Language, English Literature and Theatre Studies. As with previous years, Faculty members donate books for the annual event and the tables were lined with piles of books. 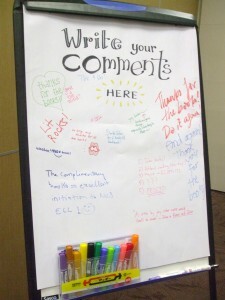 The visitors’ comments left on the board were reflective of the yearly custom’s popularity with the visitors, as most comments had thanked the Department for the books that they had taken away with them. BooksActually, an independent bookstore, had also donated goodie bags for the visitors of the English department booth. Packaged in a brown paper bag, the bag contained two copies of the now-defunct Singa: Literature in Singapore magazine and a wooden pencil, each of which was individually inscribed with the name of a famous writer. Next to the crowded tables of free books, the Theatre Studies booth featured the portfolios that students had done for the introductory module. The portfolio constitutes a considerable portion of the assessment for that module. Costume portfolios and intricately-built set pieces were among some of the works that were displayed at the booth. Similarly, the Communications and New Media booth displayed the works of the students, letting their achievements to vouch for the rich, hands-on learning opportunities that the course provides. At the Geography booth, the student volunteers informed visitors about the study abroad opportunities that were exclusive to the department in an attempt to sway students into joining the Department. Valerie Wee, a Year 2 Geography Major, said that she would try to “promote the joint minor programme between NUS and the University of Toronto” in an attempt to draw interest to the subject. Globes of various shapes and sizes were also on display, while volunteers gave out ferreo rocher chocolates to visitors. The Philosophy Department gave away free post-it pads designed by Assistant Professor John Holbo. The NUS Philosophy post-it pad contains his illustrations of Greek philosophers, as well as the tagline: “People Helping People Refute People”. Friendly volunteers at the Political Science booth handed out brightly coloured ‘keyboard brushes’ to visitors while encouraging them to take a closer look at the department booth. The region-specific departments on the other hand, scheduled cultural performances at the lobby. In conjunction with the Japanese Studies Society, the Japanese Studies department scheduled several performances throughout the day, including the Japanese Dance and the Koto Music Performance. Besides the Ranaat by Southeast Asian Studies Programme, the Department had also scheduled Thai Music Performances at 12.40pm and 3.55pm respectively. Overall, it was an enjoyable experience at FASS @ NUS Day 2010. 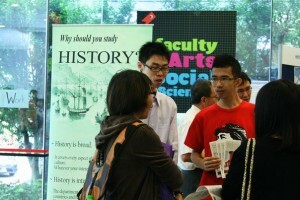 The event was visited by a large number of prospective students, while parents of these student visitors were few in number, as compared to the general NUS Open House. The friendly exchanges with the volunteers gave the student visitors a friendly welcome to the faculty and many left the event more well-informed about the programmes offered at FASS. Help us make a stand! Help support our cause of bridging the digital divide by enabling people with disabilities through technology. The Infocomm Accessibility Centre (IAC) provides training in infocomm technology to people across disability types.To prove that there are no boundaries between the abled and disabled people, we want you to join us in making your stand with a simple tweet! Make your way down to SMU Campus Green for an afternoon of great food, music and lots of awesome new friends to Tweet Meet!